When it comes to heating your home or business, few factors are more important in the long run than which type of tank you choose to use. There are tanks that rest above the ground or those that are buried below it, as well as tanks left outdoors and those kept indoors. Why do these distinctions matter? As it turns out, there are different benefits, hazards and expenses that go along with each type of tank. In this article, we will lay out the pros and cons of each, as well as other considerations, such as local climate and upkeep. Because such tanks contain hazardous materials like heating oil and propane, the EPA is strict about their regulation and maintenance. We will cover which tanks have more risk and upkeep associated with them, so you can plan accordingly and make sure you get the preferred ratio of convenience to maintenance. We will also explore the differences between heating oil and propane, as these are the two most popular heating fuels available on the market today. Let’s get started by looking at the pros and cons of these two types of fuel, where they come from and why they are so common. When crude oil is extracted from the earth, it goes to a refinery, where it undergoes all sorts of chemical and physical wizardry. Glossing over the details of how petroleum becomes so many of the fuels and products we rely on today, suffice it to say that crude oil is distilled into gasoline, diesel, kerosene and a host of other energy-rich chemicals. Heating oil is but one of these chemicals. This oil is slightly heavier than diesel, and shares its propensity for burning slowly and productively — in fact, it burns even more efficiently than diesel. Its steady burn also makes it safer than its volatile cousin, gasoline, which would be immensely risky to store near a home or business due to its tendency to explode. Heating oil is comparatively safe when properly contained. An interesting quality of heating oil is its prevalence in the northeastern United States and not much elsewhere. There are several possible reasons for this. The northeast’s infrastructure was built on oil, and so many homes run on oil furnaces that there is little economic incentive to switch to another heat source. Also, much of the northeast is quite rocky and difficult to lay pipes underground in, which is what would be required to distribute natural gas to homes and businesses. States like Maine and New Hampshire have a lot of rural communities serviceable only by dirt roads, which are best traversed by truck. 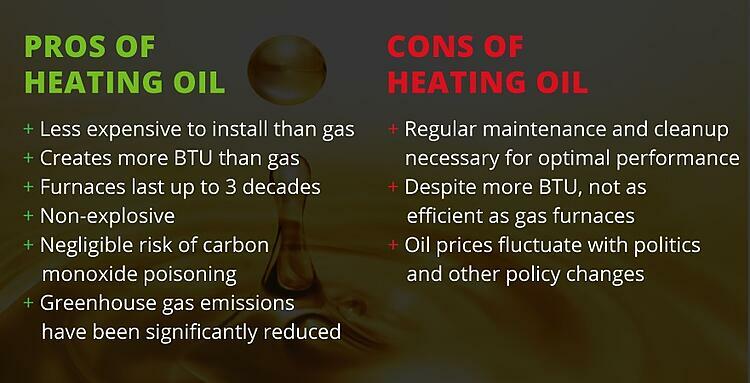 All these factors may contribute to the northeastern predilection for heating oil. Here’s another fun fact: Heating oil is dyed red so that it is legally distinguishable, and therefore exempt, from the taxes imposed on fuels for highway vehicles. Its sulfur content has also been steadily decreasing in several states over the past years. Because diesel is limited to a sulfur composition of 15 parts per million, there is a sentiment that heating oil should be subject to the same restriction. 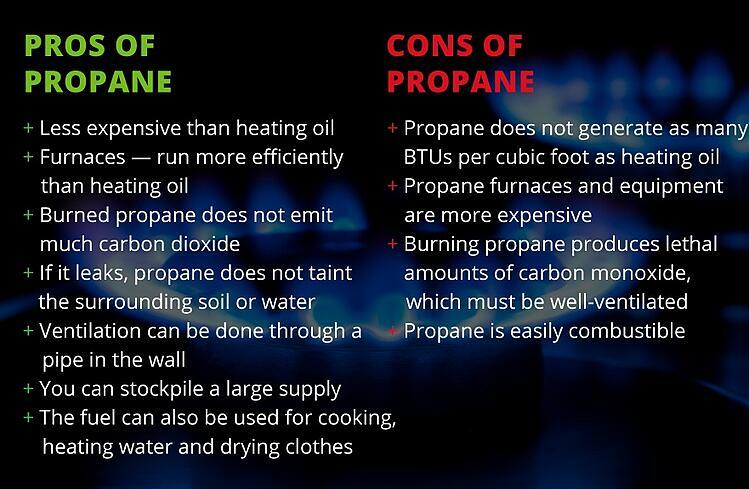 Propane differs from heating oil in several fundamental ways. First, it is not a distillate of petroleum. Rather, it is a derivative of the fuel we call natural gas, although the “natural” in this word is also a bit misleading. When companies extract this product from the ground through a process called fracking, it is rarely in the proportions suitable for distribution to customers. Its constituent gases — namely, methane, ethane, butane, pentane and propane — need to be at a particular mixture. Propane is merely one part of this gaseous cocktail, and is extracted from it. The second key difference between propane and heating oil is that propane is a gas, while heating oil is a liquid. 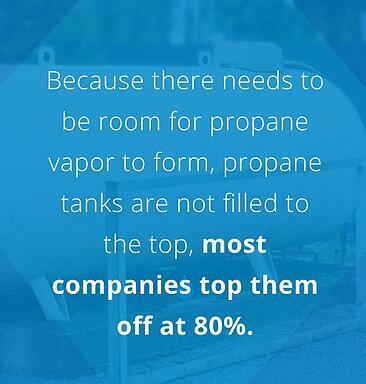 However, propane is stored mostly in liquid form when in tanks. Because it is kept at high pressure, this causes the molecules to condense and form a liquid. Doing so also causes the propane’s temperature to drop to around -40 degrees Fahrenheit, which is why propane tanks feel icy cold to the touch. The propane that is burned in our furnaces, though, is purely in gaseous form. When the valve of a propane tank is opened, the gas that escapes is the result of the liquid propane boiling off under the sudden drop in pressure. Because there needs to be room for propane vapor to form, propane tanks are not filled to the top. Most companies top them off at 80%, which leaves room for expansion when the tank sits in the hot sun. Propane gas is colorless, though thankfully it isn’t odorless, as it is not something we’d want to be breathing by accident. Propane is a highly efficient gaseous fuel. It produces far more heat than natural gas — in terms of its British thermal units, or BTUs, it puts out about 2.4 times as much heat per cubic foot. That is why you shouldn’t feel scammed for paying more for your propane than natural gas — you are getting more heat per cubic foot than you would with gas. Heating Oil vs. Propane: Is One Better for Cold Climates? Here in the mid-Atlantic and northeast, we are treated to a delightfully wide spectrum of weather. We are at the easternmost end of a vast continent, which puts us at the confluence of warm moisture from the Gulf of Mexico and cold, dry air from the expanses of Canada and the northern United States. However, we are also relatively close to the ocean and much farther south than more temperature places like Great Britain, which moderates our climate and gives us warm summers. For those bitterly cold winters, though, we want to make sure we’ve got the right fuel for the job. The good news is that propane and heating oil are both excellent choices. Admittedly, propane is a bit slicker, cleaner and fresher to the scene than heating oil, but as we’ve explained, the two run a close race. If you want to upgrade from oil to propane, it helps to make a list of your expenses. For instance, how much money and time are you spending keeping the oil system clean? Does your oil tank need repairs, or have you already had to clean up a spill? Also, are you interested in switching your cooking burners and water heater to propane? If so, you may want to consider investing in a propane system. However, if your heating oil system is in great condition and you have no pressing need to upgrade it, you may just choose to stick with it. 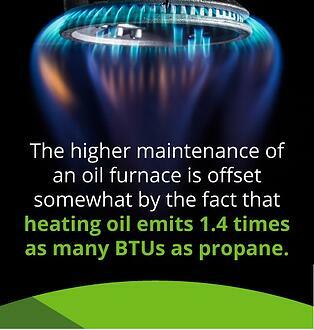 The higher maintenance of an oil furnace is offset somewhat by the fact that heating oil emits 1.4 times as many BTUs as propane. Before we move on to above-ground vs. below-ground tanks, let’s take a quick look at the different types of propane tanks. Above-ground propane tanks typically come in several common sizes. There are 20-pound, 33-pound, 100-pound and 420-pound tanks for average residential use. These tanks typically sit on the ground and do not need support structures beneath them. Larger tanks, namely 500-gallon, 1,000-gallon and beyond, are horizontal capsule tanks commonly installed on concrete slabs. What size tank you need depends on what uses you have for your propane and how long you want to be able to last without refilling. If you are stocking up on propane to get you through long power outages while still using appliances, a bigger tank might make the most sense. Oil tanks are typically either cylindrical or capsule-shaped. The key difference between these two shapes is that capsules can be stored either vertically or horizontally, while cylinders must be stored horizontally. These options give the consumer a selection of choices depending on where they would like to place the tank. 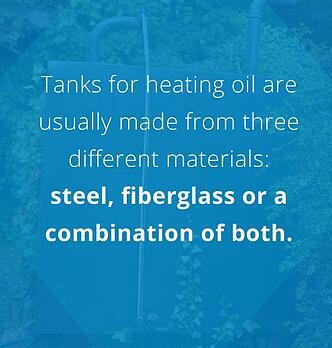 Tanks for heating oil are usually made from three different materials: steel, fiberglass or a combination of both. Steel is strong, less expensive and very common, with its main drawback being its risk of rusting — rust inside an oil drum will contaminate the oil and interfere with the workings of the furnace. Fiberglass is becoming more popular as an alternative, as it does not run the risk of contaminating the oil. We all know the sight of tanks situated above the ground. They are shaped like large capsules or cylindrical drums, depending on whether they contain propane or heating oil. Because propane is pressurized, its tank is specially engineered to withstand the internal outward force and the variations that occur with temperature and sunlight. These tanks typically rest behind buildings, where they are out of sight and yet still accessible for refilling. This brings us to the main concern with above ground tanks: they are not terribly attractive. Having one in your yard conjures a sense of industrial utilitarianism, which in most cases is not complementary to the aesthetics of a home. For this reason, many people will situate their tanks around the back side of a house, where they are out of sight of passing cars and neighbors. With a little luck and clever planning, they can even be out of view when you look out the windows of the home. Therein lies another reason homeowners keep tanks hidden as often as possible: to protect them from impacts with cars and lawnmowers. The primary concern with above-ground tanks is keeping them sturdy and operational to avoid leaks. Having them near the road runs a risk of collision, and having them too close to the driveway is asking for trouble, as well. In general, above-ground tanks are more vulnerable to damage from their surroundings. However, there is a plus side to this high visibility: When a leak occurs on an above-ground tank, they are easy to repair. Mechanics can access every surface of the tank to fix it, and furthermore, it is much easier to detect a leak in the first place. Place the tank out of the way of passing cars, including both those on the street and those on your driveway. If the tank is surrounded by grass, make sure it is not at risk of being hit by a riding lawnmower. These impacts can do severe damage to the tank. Make sure your tank is away from any sources of open flame, like fire pits and smoking areas. If your tank is next to your house, keep it safe from your roofline. Runoff from your gutters, especially ice and falling snow, can turn into projectiles that threaten the security of your above-ground tank. Keep your tank protected from vandalism by keeping it out of sight. One solution to mediating the risks and unsightliness associated with above ground tanks is to put them underground. This method removes the tank from sight and frees the space above for other purposes, while also eliminating the risk of collision with a car. There are more advantages to below-ground tanks as well. Because the tank is out of sight, the risk of vandalism drops significantly. If you are in a high-crime area, consider underground tanks to minimize the risk of theft. Below-ground tanks are also impervious to changes in weather. No matter what the temperature outside is, the surrounding earth will insulate your tank. However, there are some considerations to take note of before diving into this luxurious upgrade. First off, in some cases, it might make more sense to install an above-ground system. If you are in an area with significant amounts of bedrock under the soil, digging a hole for a tank will involve blasting dynamite — hardly an expenditure most people are willing to make. Additionally, below-ground tanks are at risk of floating. This phenomenon occurs when the groundwater level rises above the level of liquid in the tank, creating buoyancy and causing the tank to drift upward. You can mitigate this risk by placing your tank in a concrete slab. However, if floods are common in your area, an above-ground tank is almost certainly a better option. There is also the issue of cost. Installing a below-ground tank involves excavators and digging before the tank is even installed, which adds significantly to the cost. Because the tank is underground, there is also an increased risk of its fuel leaching into the surrounding soil and groundwater. Consequently, there are several components designed to prevent corrosion and contamination of soil, and which you must have inspected regularly to meet the EPA’s guidelines. Make sure to hire certified professionals to handle your tank installation. Because of the risk of soil and groundwater contamination, the government takes proper installation very seriously. Check the average water table heights in your area and make sure your tank isn’t at risk of floating. See if your home is built on soil or ledge — rock will make a below-ground tank less practical to install. Consider the cost will likely be several times higher than that of an above-ground system. Indoor tanks are common because they eliminate several of the hazards present in outdoor tanks of both the above-ground and underground variety. Because propane is unsafe to store indoors, indoor tanks can only use heating oil. Many tanks are installed in the basement or garage, generally near the furnace, where they are safe from the fickle whims of weather and freezing temperatures. The indoors are not only free from frost, they are also frequently waterproofed to prevent flooding. Moisture can be controlled, which stops rust before it can start. If placing a tank indoors, make sure it is clear from areas where everyday activities occur. Keep it shielded from parked cars in the garage, and far enough from the wall where it can be easy to inspect without having to move it. Also, keep it at least five feet from flames. Keep a drip tray beneath the tank to prevent any spills from soaking into the floor or ground. If you are using propane, or if the thought of storing a large quantity of oil inside your home is not your cup of tea, perhaps the outdoor solution is for you. The good news is that technology and manufacturing have created a fleet of outdoor tanks that can withstand lots of brutal conditions. When replacing an outdoor tank, be sure to check for signs of contamination that may have occurred previously. Though expensive to clean up, having an oil spill on your property can have lasting effects and can even cause you legal trouble down the road. Overall, though, outdoor tanks are an economical and easy way to get started with heating oil or propane, and they will last you for years to come. Our customers renown Smart Touch Energy for our innovation, responsiveness and commitment. We have been in business for over a decade and have taken a bold stance in innovating new ways to distribute energy to customers. Though we began in Boston, we have expanded to cover most of the northeast and mid-Atlantic. Because energy is one of the largest issues facing the world right now, creating smarter ways to distribute it — even in our relatively affluent nation — is one of the most important problems to solve. To join our growing network of fuel customers, visit our website and check out our propane and heating oil delivery options. Our prices are always competitive, and we are always ready to answer your questions and address your needs. Check fuel prices and visit Smart Touch Energy today to take the next step.